Researchers using NASA's Fermi Gamma-ray Space Telescope have discovered the first gamma-ray pulsar, J0540, in a galaxy other than our own. The object sets a new record for the most luminous gamma-ray pulsar known. J0540 is a rare find, with an age of roughly 1,700 years, about twice that of the Crab Nebula pulsar. 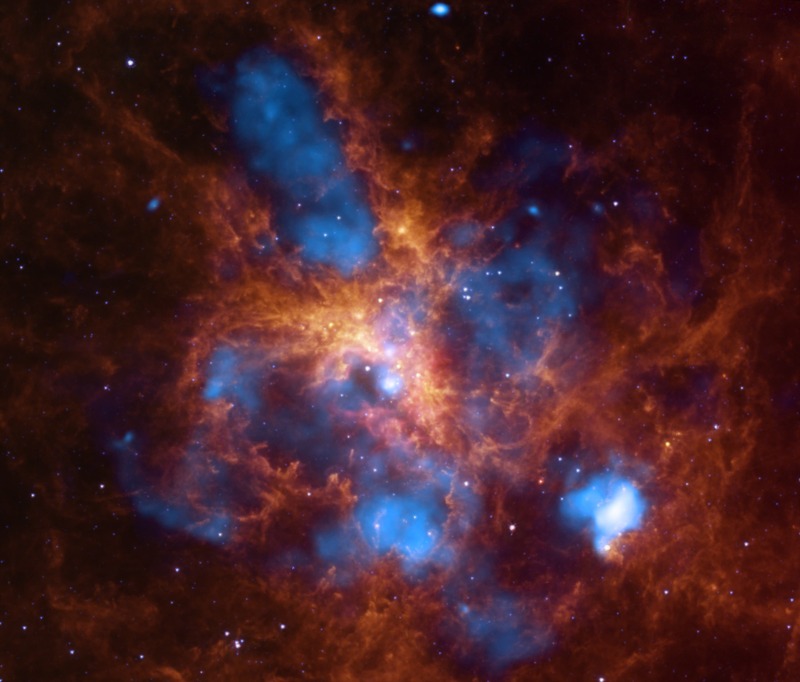 By contrast, most of the more than 2,500 known pulsars are from 10,000 to hundreds of millions of years old. The pulsar lies in the outskirts of the Tarantula Nebula (image above) in the Large Magellanic Cloud, a small galaxy that orbits our Milky Way and is located 163,000 light-years away. The Tarantula Nebula is the largest, most active and most complex star-formation region in our galactic neighborhood. It was identified as a bright source of gamma rays, the highest-energy form of light, early in the Fermi mission. Astronomers initially attributed this glow to collisions of subatomic particles accelerated in the shock waves produced by supernova explosions. When a massive star explodes as a supernova, the star's core may survive as a neutron star, where the mass of half a million Earths is crushed into a magnetized ball no larger than Washington, D.C. A young isolated neutron star spins tens of times each second, and its rapidly spinning magnetic field powers beams of radio waves, visible light, X-rays and gamma rays. If the beams sweep past Earth, astronomers observe a regular pulse of emission and the object is classified as a pulsar. 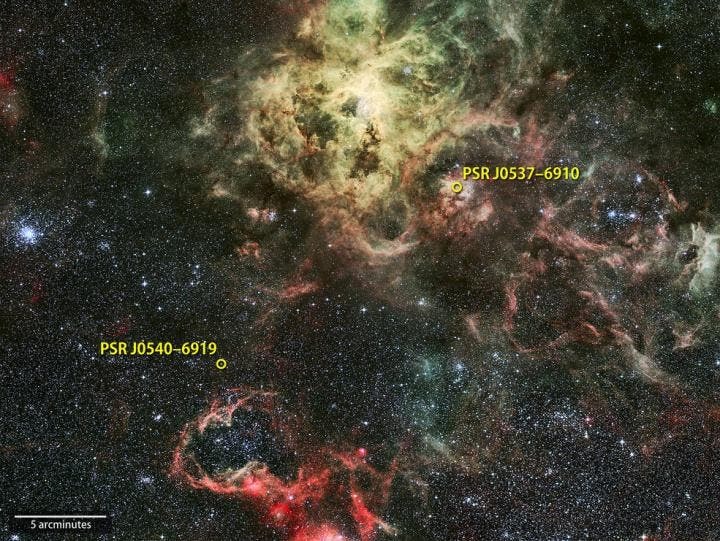 The Tarantula Nebula was known to host two pulsars, PSR J0540-6919 (J0540 for short) and PSR J0537?6910 (J0537), which were discovered with the help of NASA's Einstein and Rossi X-ray Timing Explorer (RXTE) satellites, respectively. J0540 spins just under 20 times a second, while J0537 whirls at nearly 62 times a second — the fastest-known rotation period for a young pulsar. Nevertheless, it took more than six years of observations by Fermi's Large Area Telescope (LAT), as well as a complete reanalysis of all LAT data in a process called Pass 8, to detect gamma-ray pulsations from J0540. The Fermi data establish upper limits for gamma-ray pulses from J0537 but do not yet detect them. Martin and his colleagues present these findings in a paper to be published in the Nov. 13 edition of the journal Science. "The gamma-ray pulses from J0540 have 20 times the intensity of the previous record-holder, the pulsar in the famous Crab Nebula, yet they have roughly similar levels of radio, optical and X-ray emission," said coauthor Lucas Guillemot, at the Laboratory for Physics and Chemistry of Environment and Space, operated by CNRS and the University of Orléans in France. "Accounting for these differences will guide us to a better understanding of the extreme physics at work in young pulsars." Despite J0540's luminosity, too few gamma rays reach the LAT to detect pulsations without knowing the period in advance. This information comes from a long-term X-ray monitoring campaign using RXTE, which recorded both pulsars from the start of the Fermi mission to the end of 2011, when RXTE operations ceased. Prior to the launch of Fermi in 2008, only seven gamma-ray pulsars were known. To date, the mission has found more than 160. NASA's Fermi Gamma-ray Space Telescope is an astrophysics and particle physics partnership, developed in collaboration with the U.S. Department of Energy and with important contributions from academic institutions and partners in France, Germany, Italy, Japan, Sweden and the United States.